Manufacturer's Website Audio Concepts Inc.
Dimensions H x W x D 12" x 8.5" x 12.5"
MSRP $1500, extra for premium finishes. Warranty and Return policy 30 day return policy. Five years limited warranty, transferable to second owner. I have much regards for Mike Dzurko and his team at ACI, ever since I reviewed their awesome Force subwoofer. So when Mike offered the latest revision of his Sapphire model (quite a while ago), I made a mental note to take him up on it when my roster was freed up a bit. The snows melted and flowers bloomed...and I was done with reviewing vinylaphilia (for a while at least), and I was in a funk to review some speakers. A quick phone call and a few weeks later I had the Sapphire XLs in hand. Some big claims are made around these speakers. The drivers are said to be from the ScanSpeak Revelator series, and the woofer is the same as in several models from Triad and the Gershwin Black Swan. Another claim that caught my attention was the bass response; -3db at 48hz and usable (not sure what that really means) down to 38-40hz. The cabinet has an unusual profile, something they call "dual-depth". It is said to reduce internal standing waves and provide a stable and non-resonant enclosure (the accomplished also by heavy MDF and elaborate bracing). Speaking of heavy, the bloody things weigh 22 lbs each! Even more than my Dynaudio Contour 1.3 MkII, for those that feel assured of quality by things of heft and substance...the Sapphire XLs will impress. I feel that I must spend a few words on their very commendable and brilliant warranty and trial policy. They offer a standard 5 year warranty which can be further extended to a second owner, such a policy tends to make the purchase more appealing by inspiring confidence and boosting resale values (Bryston is the industry leader in this aspect). And since ACI only sells factory direct, they sweeten the pot by offering a 30 day no-hassle return (with some very reasonable stipulations). So you can audition in-home and at-length, which I feel is the only real way to be sure if a component is right for you. I strongly advocate that all audio gear be purchased this way. My experiences have convinced me, that even the lengthiest audition in another location (dealer, friend's house, trade show) and system is wholly inadequate. Your risk - the one-way cost of shipping back to the factory; a fair and well crafted policy I say. ACI Sapphire XL vs. Dynaudio Contour 1.3 MkII This is not exactly a fair comparison, since this Dynaudio retailed for $2400 USD when it was discontinued a few years ago, and the replacement model sells for $2800 USD. So this is a comparison to a model roughly twice the price. But I was curious whether the Sapphire XL was a "giant slayer", and also understand its performance relative to my long time reference. The Dynaudio seemed to extend a bit lower in the bass frequencies (as one would expect from the specs), but also sounded a lot cleaner. When played at high levels, the synthesizer on this track caused both speakers to produce audible turbulence from their ports; the distortion being a bit higher on the Sapphire. Also, bass notes on the Sapphire sounded a bit darker and slower when directly compared to the Dynaudio. Although the differences were much smaller on this track, the Sapphire was relatively a bit shut-in and less open sounding than the Dynaudio. I use this track to test for resolution and dynamics in the treble region. The Dynaudios delivered a more detailed and cleaner presentation, this was especially noticeable on the sympathetic strings of the sarod. I would not have faulted the Sapphire without the benefit of this direct comparison; but relatively speaking it was not able to resolve nth degree of resonances in the treble region as well. In absolute terms, both speakers were tremendously impressive on their reproduction of female vocals on this track. But when compared directly, the Sapphire XLs were a fair bit less detailed and a bit dark sounding. This track was used to test mainly for performance on male vocals, and the results were virtually identical to the Diana Krall track tested above. The Dynaudio was an obviously superior product, but for nearly twice the (inflation adjusted) price it had better be. I would say that given the expected scales of diminishing returns for audio gear, the results were as expected; i.e. 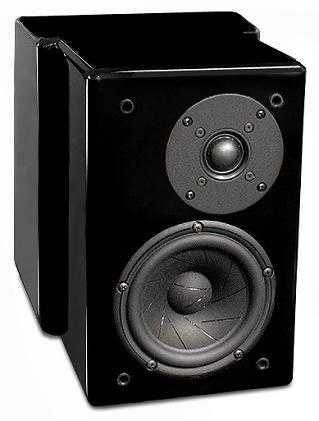 the Dynaudio was better but not about twice as good as the Sapphire XL. The Sapphire XL may not be able to slay giants or run with them, but it certainly does play on the same team albeit as a junior member (sorry for the mixed metaphors). This is more of a comparison of price point peers, though these two products are built with a very different approach. The previously reviewed Dulcet compromises on extension in the frequency extremes and high output capability to focus on higher resolution and naturalness. Whereas, the ACI is more of a conventional design, attempting to not compromise heavily in any one area. On this test for female vocals, the Sapphire was relatively a fair bit less detailed and a bit dark sounding than the Reference 3A, which had proven to be a champ in things mid-range. Without the direct comparison, I would not likely have had a nit to pick with the Sapphire XL and would instead have gushed profusely about its wonderful performance. On this test for male vocals, the results were the same as on the above Diana Krall piece. The Sapphire seemed to have more treble detail than the Dulcet; but that finding does not make sense when you consider my above note when comparing the Sapphire to the Dynaudio and in a previous review where I compared the Dulcet to the Dynaudio (Ah-ha, caught in my own web of lies). But seriously, there are two possibilities here. One, that the Dulcet's treble was tipped down relative to its midrange, hence fooling my ears into thinking that the treble detail was lesser than the Sapphire. Or, that I was thrown off by something new that I had never experienced before - a palpable midrange. I could actually feel the impact of the strings being plucked, when listening through the Dulcet. I attribute this directly to the Dulcet's outstanding mid-range transient response. The added sense of realism was very exciting and addictive (sometimes I think I live for these "new highs"). A subsequent comparison of the three speakers confirmed what I heard above. The spectral balance of the Reference 3A Dulcet is a bit de emphasized in the treble region; whereas, the Dynaudio Contour 1.3 MkII and ACI Sapphire XL seemed to have more of a balanced response across the frequencies. This finding was also reinforced with a pink noise track. The male vocals on this track seemed a bit more detailed and a lot better on delivering the macro dynamics via the Dulcet. Again, I likely would not have been able to find any relative shortcomings in the Sapphire XL, had I not done a direct comparison. The Dulcet was a bit more detailed and projected a sound that was more "free of box" than the Sapphire XL. While the Dulcet was relatively superior in the all-important mid-range, the Sapphire XL was more balanced across the spectrum. Personal taste would definitely come into play here. I personally would go with the Dulcet if I was setup in a small room and was using a subwoofer or in a near-field situation; but would likely choose the Sapphire XL in all other situations. I think Mike Dzurko and his team have produced another fine product (also, read the TNT-Audio review of the smaller Emerald model). If my speaker budget was capped at $1500 USD, I needed a speaker with no major compromises in any one area and was planning to live without a subwoofer...the Sapphire XL would be a must on the audition list, and with their 30 day money-back guarantee what would one have to lose (but possibly a few bucks to return the samples).